In 1925, the Crosley Radio Corporation introduced a small 1-tube regenerative radio called the Crosley Pup that sold for $9.75. This redesign of the Crosley Model 50, crammed into a small metal cabinet, became an overnight success. The popularity of this radio can be attributed not only to its low price but also to a very clever advertising campaign. Although Crosley attributed the name "Pup" to the small size of the radio, it didn't take long for the company to capitalize on the name of this radio. The first ad for the Crosley Pup appeared in the July 27, 1925, issue of the Crosley Radio Weekly. In this same issue the following reception contest was announced: "$1,000 Prize Contest -- A grand prize of $1,000 is offered to purchasers of the Crosley "Pup" for best report of results obtained over the period from September 1, 1925, to March 1, 1926 in addition to monthly prizes, including real live pedigreed puppies. Full details and entry blank in each box." Figure 1. 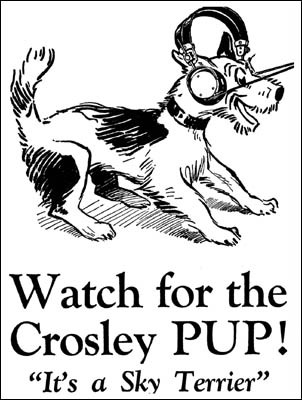 An early Crosley advertisement featuring the Pup. In the October 26, 1925, issue of the Crosley Radio Weekly, a headline reads, "More Than 14,000 Crosley Pups Sold Within Five Weeks." This same issue states that the six pedigreed "Pups" for the reception contest will be as follows: Strongheart Police Dog, Jefferson White Collie, Cairn Terrier, Shepherd puppy, Irish Terrier, and Doberman Pinscher. Ads for this radio have it teamed with a canine mascot that resembles a Terrier breed of dog. 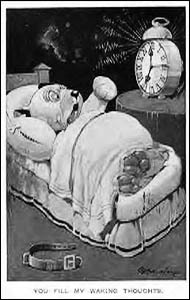 In fact, an early Crosley ad, shown in Figure 1, stated: "Watch for the Crosley PUP! It's a Sky Terrier." 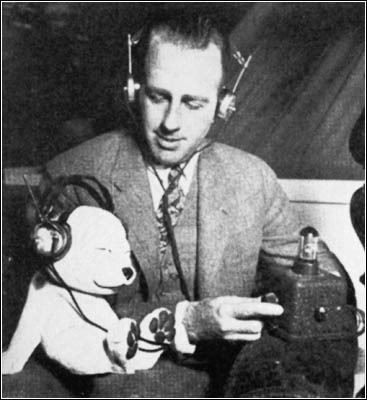 In this same time period, Crosley also adopted another "Pup" to be the radio's mascot. 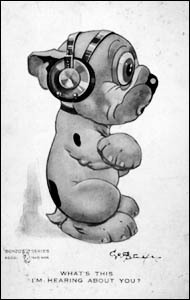 This was the famous cartoon dog Bonzo wearing a set of Crosley headphones. Designed to be displayed along with the Pup radio, this new mascot was obviously chosen because of the immense popularity of the cartoon figure Bonzo. Bonzo was the creation of British artist George Studdy. 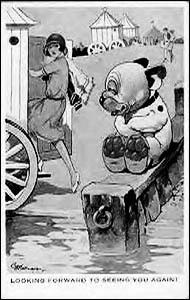 In the early 1920s, this mischievous, pudgy pup called Bonzo was the inspiration for much commercial merchandise, such as cuddly and mechanical toys, ashtrays, pincushions, trinket boxes, car mascots, jigsaw puzzles, books, calendars, candies, and a profusion of postcards. Examples of the postcards are shown in Figure 2. Figure 2. Examples of the colorful Bonzo postcards created by George Studdy. "You Fill My Waking Thoughts." "What's This I'm Hearing About You?" "Looking Forward to Seeing You Again!" You name it and there was an item produced either with or in the image of Bonzo. They were not only produced in England, Bonzo's home country, but also in America, Austria, Belgium, Czechoslovakia, Denmark, France, Germany, Japan, the Netherlands and Spain! A word search using Bonzo on the online auction service eBay recently revealed 116 items! These items include salt & pepper shakers, postcards, toothbrush holders, egg cups, pin cushions, and nut cups, just to name a few. (Sorry, no Crosley Bonzos were listed.) The quantity and variety of Bonzo memorabilia, both old and new, attest to the continued popularity of this cute cartoon figure. Crosley used the Old King Cole Papier Mâché Company on Market Street in Canton, Ohio, to manufacture papier mâché figures of Bonzo for use in store displays. The 9-inch tall Bonzo sported headphones with "CROSLEY PUP" embossed on the headphone band. See Figures 3 and 4 (see print version). It is interesting to note that the same company also manufactured the papier mâché Nippers of around 14" to 42" for use as RCA dealer displays. The store display of Bonzo became so popular that Crosley finally offered them to dealers for sale to the general public. Page 1 of the March 15, 1926, issue of the Crosley Radio Weekly, shown on page 9 (see print version), announces that "Bonzo" is now for sale. The illustrations on this page appear to be the same papier mâché figure shown in Figure 5 (see print version), since "CROSLEY PUP" is embossed on the headphone band. A similar ad also appeared in an early issue of the Crosley Radio Broadcaster. Most of the figures sold to the public were a smaller version of "Bonzo" made from a chalk composite. The chalk Bonzo, shown in Figure 6, is about 41/2" tall and has a slightly different pose with only the word "CROSLEY" embossed on the headphone band. Figure 6. 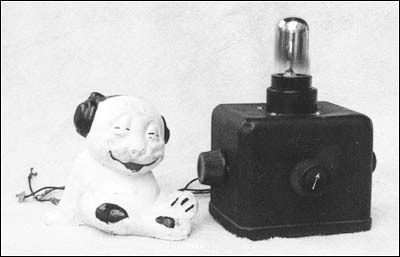 The Crosley Pup radio, with a smaller, chalkware Bonzo, the size more commonly available to the public. Many collectors think of Bonzo as the sole mascot for the Pup radio. My research has proved that is not the case at all. While it is true that Bonzo was created to be displayed with the Pup radio, Crosley continued to use the "Sky Terrier" in its print ads for the Pup and also on the box label. In fact, except for the Bonzo ad reprinted in this article, which was aimed at Crosley dealers, you will not see the Crosley Bonzo in any Crosley print ad. So, if Bonzo was such a popular novelty for Crosley, why didn't he show up in its print ads? I think the answer to that is fairly simple -- Crosley capitalized on the popularity of Bonzo without paying royalties to his creator, George Studdy. If you have any doubt about this, just read the last part of the Bonzo article from the Crosley Radio Weekly again: "Send your order immediately for half a dozen of these PUPS that have become nationally famous because of the prominent position they have occupied in the windows of Crosley dealers in all sections of the country." Notice there is no mention of Bonzo already being an immensely popular cartoon character. Both Bonzo and the Sky Terrier faded away with the 1-tube Crosley Pup. In 1933, Crosley used the name "Pup" on a cheap 4-tube superhet that sold for $26, but neither Bonzo nor the Sky Terrier was used to promote this set. Nevertheless, the decision to add Bonzo as a mascot was obviously a very smart marketing ploy for the Crosley Corporation. The Crosley Bonzo makes a fine addition to any radio collection. Both the papier mâché and chalkware versions are much harder to find than a Crosley Pup radio. It was only after I obtained my chalkware version of the Crosley Bonzo from Mid-South Antique Radio Collectors member Jack Curry that I purchased a Crosley Pup radio to go along with it. I have seen a papier mâché Crosley Bonzo on display at the Smithsonian Museum, and I know of a few collectors who have one of these unique pieces. The papier mâché version did not survive in numbers because of the fragile nature of papier mâché, and most of the smaller chalkware Bonzos suffered the fate of other low-cost novelties of this era -- namely, the trash bin. But, they and other Bonzo products are still out there, hiding in a box in an attic or basement, or perhaps sitting unnoticed on a shelf in an obscure junk/antique store. A word of caution is in order as you begin to scour the country in search of a Crosley Bonzo: Reproductions have shown up out there, so if that chalkware Bonzo looks too new to be real, he probably isn't. I find the Crosley Bonzo story to be a small, yet interesting piece of radio history. To find out more about George Studdy and his creation, Bonzo, I recommend that you visit the Web site of Richard Fitzpatrick noted below. Richard offers a wealth of information on this subject, as well as many photographs and links to other sites with George Studdy information and photos. Without Richard's kind assistance this article would not have been possible. Crocker, Dave, Crosley Radio Historian and member of the A.R.C. Editorial Staff, interview. Crosley Radio Weekly. July 27, 1925, October 26, 1925, and March 15, 1926. Palm, Peter, Crosley Radio Historian, Cincinnati, Ohio, interview. Reprint of mid-1920s Crosley ads, source unknown. Stinger, Charles, Crosley Radio Historian & retired WLW employee, Hamilton, Ohio, interview. "A Trip Through WLW," reprint of 1935 pamphlet. Publisher: The Crosley Radio Corporation. John Miller's interest in radio began in high school when an old family friend gave him a Zenith 5S127. He subsequently restored this set via Jim Fred's "Radio Topics" in "Elementary Electronics" magazine. An active collector since 1974, he has narrowed his interests to cathedrals and pre-1940 Zeniths. Subscribers will remember his amusing April "Eliminator" articles in A.R.C. Copyright © 1996-2001 by John V. Terrey - For personal use only. Last revised: June 30, 2001.